Visualization of Venus Express during the aerobraking maneuver, which will see the spacecraft orbiting Venus at an altitude of around 130 km from 18 June to 11 July. If the spacecraft survives and fuel permits, it will be raised back up to approximately 450 km, allowing operations to continue for a few more months. Eventually, however, the spacecraft will plunge back into the atmosphere and the mission will end. A European spacecraft will plunge into Venus' thick atmosphere next month in a bold maneuver that may bring its lengthy and productive mission to a dramatic end. The European Space Agency's Venus Express probe, which has been circling Earth's hellishly hot "sister planet" for eight years, is running low on fuel. So mission officials wrapped up routine science operations this week to begin preparing Venus Express for a deep dive into the planet's fast-swirling air. "It is only by carrying out daring operations like these that we can gain new insights, not only about usually inaccessible regions of the planet's atmosphere, but also how the spacecraft and its components respond to such a hostile environment," Martin added. Venus Express will take temperature and pressure measurements and gather other science data during the dive, which is scheduled to take place from June 18 through July 11. But mission officials expect the "aerobraking" maneuver will have other benefits as well. 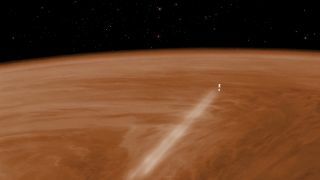 "The campaign also provides the opportunity to develop and practice the critical operations techniques required for aerobraking, an experience that will be precious for the preparation of future planetary missions that may require it operationally," Paolo Ferri, head of mission operations for Venus Express, said in a statement. Venus Express launched in November 2005 and arrived at Venus in April 2006. Its orbit is extremely elliptical, taking the probe as close to the planet as 155 miles (250 km) and as far away as 41,000 miles (66,000 km). The spacecraft has used its seven science instruments to learn a great deal about Venus' atmosphere and surface over the years. For example, Venus Express has spotted flashes of lightning in the planet's sulfuric-acid clouds and determined that wind speeds mysteriously increased from 186 mph (300 km/h) to 250 mph (400 km/h) over a span of six Earth years. The mission's infrared measurements also suggest that Venus might have had a system of plate tectonics in the past, as Earth does today, as well as an ocean of liquid water. Other observations indicate that the planet was likely volcanically active as recently as 2.5 million years ago, and may still be so today, officials said. "Venus Express has taught us just how variable the planet is on all timescales and, furthermore, has given us clues as to how it might have changed since its formation 4.6 billion years ago," said project scientist Håkan Svedhem. "This information is helping us decipher how Earth and Venus came to lead such dramatically different lives, but we've also noticed that there are some fundamental similarities." Earth and Venus are about the same size and formed at roughly the same time. But Venus is a much more inhospitable world than our own, with surface temperatures topping 840 degrees Fahrenheit (450 degrees Celsius) and a super-dense atmosphere composed of toxic gases. Venus Express may not survive the upcoming deep dive, officials said. But if it does, the probe's handlers will boost its orbit once again and command it to keep gathering data for a few more months, until its fuel runs out. Whatever happens, Venus Express' mission will likely be over by the end of the year, mission officials said. "Venus Express has penetrated deeper into the mysteries of this veiled planet than anyone ever dreamed, and will no doubt continue to surprise us down to the last minute," Svedhem said.